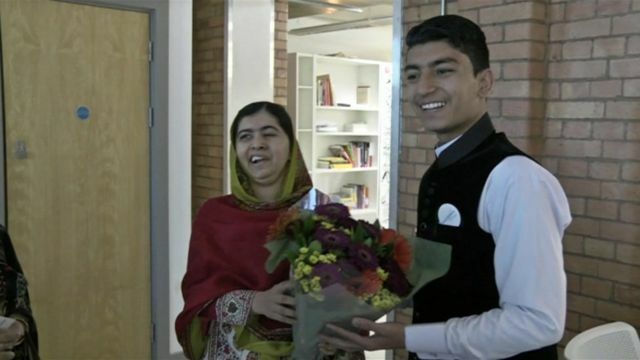 Meeting Malala: Teen's dream come true Jump to media player A teenage boy from Pakistan, who has a life-limiting illness, has been flown to Birmingham to fulfil his wish to meet the Nobel Peace Prize winner, Malala Yousafzai. Malala: 'I promised to help people' Jump to media player Education campaigner Malala Yousafzai has turned 18, and marked the day by opening a school for Syrian girls. Malala at refugee school on 18th birthday Jump to media player Education campaigner Malala Yousafzai has turned 18, and marked the day by opening a school for Syrian girls in an informal refugee settlement in Lebanon's Beka'a Valley. Al teenage boy from Pakistan, with a life-limiting illness, has been flown to Birmingham to fulfil his wish to meet the Nobel Peace Prize winner Malala Yousafzai. Anwar Ullah, 17, suffers from a rare form of lung cancer. His meeting with Malala was arranged by the Make A Wish Foundation. The pair spent an afternoon chatting and playing board games. In 2012, Miss Yousafzai was shot in the head by a Taliban gunman for demanding that girls be allowed to receive an education. After the visit, Anwar Ullah said, "My dream has come true."